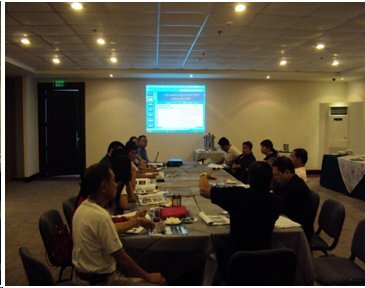 The USAID-funded Philippines Integrity Project (iPro) administered by Management Systems International (MSI) builds on work done from 2006 to 2009 by MSI on the MCA Threshold Anti-corruption effort. That program provided substantial training, research and equipment support to the Office of the Ombudsman and other anticorruption agencies to enhance their capability in investigating and prosecuting corruption. Through iPro MSI is continuing to support the process of reducing corruption by seeking synergies between Government of the Republic of the Philippines (GRP) agencies and between government and civil society at all levels. Philippine anticorruption agencies need a system for the transparent monitoring of corruption cases, from investigation to trial. Institutional cooperation among accountability agencies must be harnessed and sustained for better detection of corruption and improvement of public sector systems. And corruption prevention standards and processes at the national level also need to be carried out by local governments. · Strengthening the Office of the Ombudsman (OMB). iPro assists the OMB in reengineering its business process in order to build better case records and information management capabilities and improving capacity to use the Information Technology physical infrastructure now in place. A system to manage judicial court case evidence to support more successful prosecutions at all levels is an important complement to this effort. · Supporting Effective Prosecution of Corruption Cases in the Lower Courts. iPro works with OMB and the Department of Justice (DOJ) to build an effective system for successful prosecution of lower court corruption cases. iPro supports completion and maintenance of an accurate database of cases to use as a tool for sound caseload management. A Memorandum of Understanding between OMB and DOJ will support their collaboration on successful, timely prosecution, and training to make prosecutors more effective. A civil society-based court watch program complements these efforts by seeking to assist in making the lower courts more efficient in handling corruption cases. · Building institutional cooperation to reduce corruption. To be successful initiatives in the fight against corruption by concerned agencies must be done cooperatively. iPro provides specific targeted support for the strengthening of the cooperation between the OMB, the Commission on Audit (COA) and the Civil Service Commission (CSC). This support focuses on forensic audits and criminal investigations in prosecution of public officials for graft and corruption through joint training of auditors, investigators and prosecutors. · Carrying corruption vulnerability self-assessments to the local government units. The Integrity Development Review (IDR) process is a valuable tool for examining corruption vulnerabilities within national government agencies and for developing solutions to reduce those vulnerabilities. iPro supports adapting and delivering the IDR process to the local level by engaging Local Government Units (LGUs) in the process of guided self-assessment, thus assuring “ownership” of the initiatives. Complementing this activity is the conduct of LGU peer mentoring program which aims to support robust LGUs mentor/train other LGUs in addressing local governance challenges. To effectively implement these activities, iPro encourages the continued participation of applicable local and regional leagues to reinforce the strengthening of good governance in the LGUs. iPro is designed to assist the Ombudsman and the Department of Justice in developing a system for monitoring the progress of corruption cases. The project also provides technical assistance to the Constitutional Integrity Group (CIG), composed of the Ombudsman, Civil Service Commission and the Commission on Audit, for a more effective corruption detection and deterrence environment. iPro is also supporting training in Forensic Auditing and investigation of criminal cases involving public corruption, awareness of anti-corruption efforts across the country among anti-corruption agencies and civil society, as well as the application of corruption diagnostics in select local government units. The Office of the Ombudsman is improving its information management capability and developing a reliable, integrated and uniform case records management system. iPro is providing policy development and training support to Ombudsman offices to ensure that the information technology infrastructure put in place through the Threshold Program will be used for the successful prosecution of corruption and transparent monitoring of cases. Moreover, clear-cut procedures are being developed to guide field investigators in gathering and preserving evidence. iPro is assisting the Ombudsman and the Department of Justice in developing a monitoring system to track the progress of corruption cases filed in Regional Trial Courts nationwide. iPro will also support a civil society-based court-watch grant initiative. In 2004, the Ombudsman, Commission on Audit and Civil Service Commission came together to forge a memorandum of agreement for collectively pursuing anticorruption reforms such as clear delineation of jurisdiction on administrative cases against public officials, joint training of investigators, establishment of gifts and benefits policy, and review of asset disclosure policy. In December 2009, the Constitutional Integrity Group (CIG) renewed their commitment in fighting corruption. iPro provides technical assistance to the CIG policy and working committees, particularly in enhancing the use of asset disclosures and forensic audits in corruption prosecution and asset recovery. Getting audit institutions and investigatory agencies to work together in corruption cases is a challenging task beset with issues relating to jurisdiction, evidence preservation and security, and lack of coordination mechanisms. 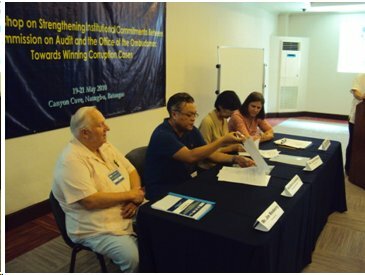 iPro brought senior officials of the two supreme accountability agencies, the Office of the Ombudsman and the Commission on Audit, together in a two-day workshop to resolve operational and logistical issues for the effective prosecution of corruption using audit reports as basis for further criminal investigation and prosecution. Among the agreements produced during the workshop were: the conduct of joint investigations for high-profile corruption cases; a centralized system for preserving and securing evidence; dedicated staff for coordination and case monitoring; inventory of active corruption cases that ensued from fraud audits; joint training of auditors and investigators; development of a guidebook on case-building and prosecution of audit-related corruption cases. A memorandum of agreement is formalizing these reforms. iPro is also supporting the application of the integrity development review (IDR) in pilot local governments. Developed with USAID support in 2004, the IDR is a set of data gathering tools that will enable a public sector agency to conduct a self-assessment on the extent to which systems, processes and practices are vulnerable to corruption. iPro is now refining the IDR to make it more suitable for local administration. Application of the IDR in 10 local government units will be carried out during the last year of the project. The two-year iPro project started in October 2009 and will conclude in September 2011. MSI, a Washington, DC based consultancy, is a subsidiary of Coffey International, Ltd. of Australia. It has been recognized worldwide that getting audit institutions and investigatory agencies to work together in corruption cases is a challenging task beset with issues relating to jurisdiction, evidence preservation and security, and lack of coordination mechanisms. With USAID support, senior officials of the two supreme accountability agencies, the Office of the Ombudsman and the Commission on Audit, gathered together in a two-day workshop to resolve operational and logistical issues for the effective prosecution of corruption using audit reports as the main evidence. The workshop was organized by the Integrity Project, a USAID cooperative agreement with Management Systems International. Among the agreements produced during the workshop are: the conduct of joint investigations for high-profile corruption cases; a centralized system for preserving and securing evidence; dedicated staff for coordination and case monitoring; inventory of active corruption cases that ensued from fraud audits; joint training of auditors and investigators; development of a guidebook on case-building and prosecution of audit-related corruption cases. On June 4, 2010, the Ombudsman and the chairperson of the Audit Commission will sign a memorandum of agreement to formalize these reforms. During the two-day summit, Ombudsman officials (left of the table) and Commission on Audit officials (right of the table) tackled the challenges in investigating and auditing public sector corruption. Deputy Ombudsman for Luzon Mark E. Jalandoni (2nd from left) and Fraud Audit Director Leonor D. Boado (3rd from left) review the mutual action plan for prosecuting audit-related corruption cases. Integrity Project Chief of Party James Wesberry and USAID Office of Economic Development and Governance Acting Chief Maria Rendon observed the review.